This article is about watercolor house portrait #276Z, of a property sold by Broker/Realtor, Renee Devedjian, of @Properties, 2571 Waukegan Road, Bannockburn, IL 60015, and written by artist and United States Navy Veteran, Stephen F. Condren, BFA-SAIC, of Condren Galleries, a Fine Arts Gallery ~ the house portrait is done first as a pencil drawing and then a pen & ink, which comes with JPEG & PDF scans for making prints, note cards, and stationery. Congratulations Renee Devedjian! The pencil drawing is the foundation of the house portrait. 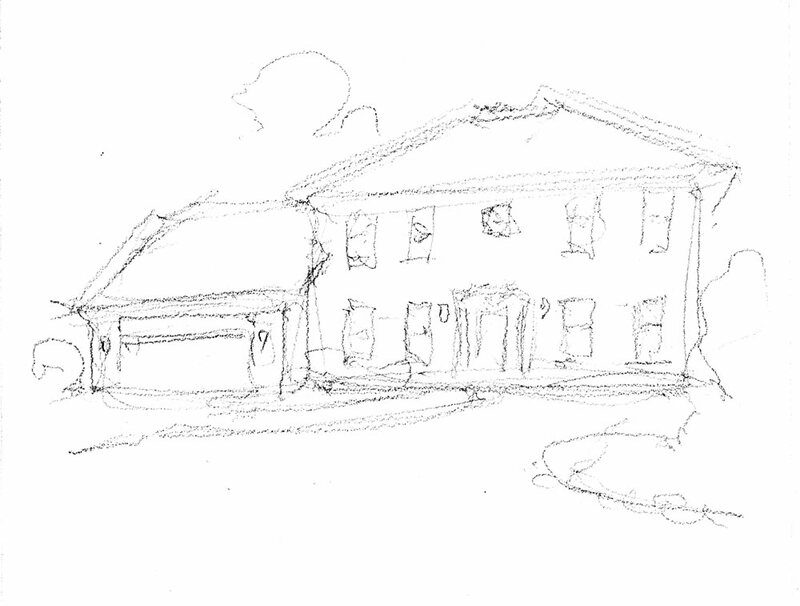 As you can see from the sketch below I have captured the image of the house precisely. The photo of the home was distorted making it recede down to the left, so I adjusted the perspective to a more natural view. All that you need in the sketch is the simple clean line. I do not busy up the preliminary sketch with shade and shadows, that is not that task at hand. Because the large ornamental tree and flowers were blocking the right side of the house, I moved them over to the right so as to get a clear view of the entire structure. 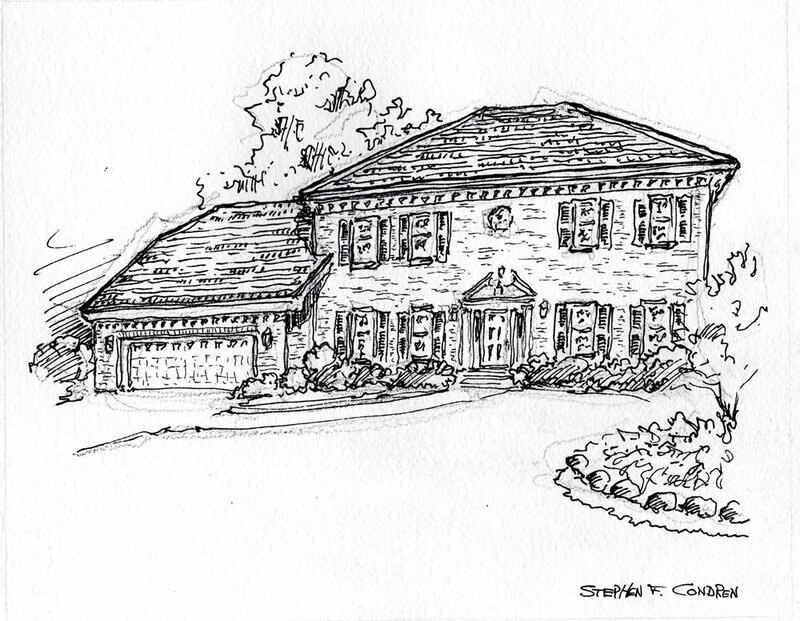 Pencil sketch of a house portrait by artist and United States Navy Veteran, Stephen F. Condren. The pen & ink drawing is where the rubber meets the road! There is no turning back at this point and you have to do it right! Once the ink hits the paper it is final, just like a house closing. You cannot use white out or other gimmicks to cover over mistakes because when you apply the watercolor it washes all the white out away! What you see is what you get. In the drawing below you can see that I have carefully followed the outline given to me from the pencil sketch from above. I enhanced the tree behind the house to have grace to the composition. Generally, I do not put ink on the background trees but this drawing seemed to call for it. Pen & ink house portrait by artist and United States Navy Veteran, Stephen F. Condren. The watercolor is very carefully applied because you cannot go back and fix it. Since watercolor is transparent you can see everything, so you have to set the colors in place correctly the first time. On both sides of the composition I have put a touch of red for the Norway Maples which are there. The sidewalk and steps are brick pavers and so I used a touch of red and brown to bring out those tones. Watercolor house portrait by artist and United States Navy Veteran, Stephen F. Condren. As a follow-up after sending the house portrait to me clients, I email them the scan of the watercolor. The scan can be put into JPEG or PDF formats for making note cards or stationary as follow-up gifts for clients. Condren Galleries is pleased to have been to participate in the execution of watercolor house portrait #276Z for Realtor Renee Devedjian. As an artist I have made watercolor house portrait #276Z a staple of my architectural rendering works. 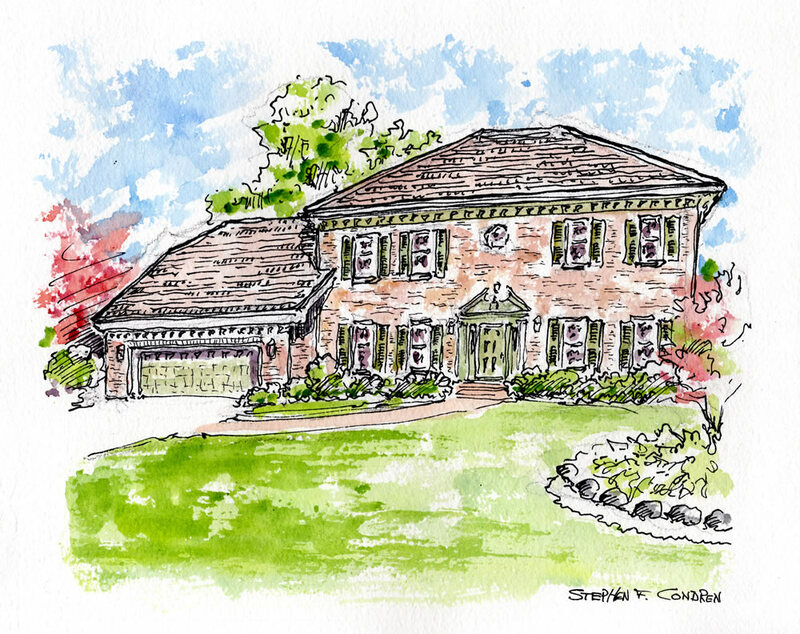 Watercolor house portrait #276Z pen & ink drawing with prints by artist Stephen F. Condren at Condren Galleries.